The spring season of 2015 has begun. Slowly from now on new seasons strawberries, asparagus, sugar snaps and all the other spring produce will hit the shelves. I had my first asparagus shoots of the year last week, and they were just as delicious as I remembered. The season is a bit later this year, delayed slightly by the cold weather. Asparagus can sometimes be found in August. For a chef, seasonality breeds creativity. As a season ends, you have to create something new to replace it using what is coming into season. When I was in the UK cooking, produce arrives from the global markets, seasonality needn’t be a problem. You can get anything fresh, anytime of the year. This was amazing for menu planning, but easy to get stuck in a rut. That’s why in the restaurant I like to keep my eye on what’s fresh. I often look around the produce department to see what’s new. Of course now it’s bigger and newer it is so much easier. Here’s an easy recipe to make the most of the new seasons strawberries. Purée half the strawberries in a blender. 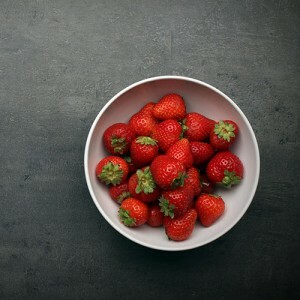 Chop the remaining strawberries, reserving four for decoration. Spoon equal amounts of the mixture into 4 cold wine glasses. Serve garnished with the remaining strawberries and a sprig of mint. It can be made in advance, however to keep the meringue crunchy it’s best to fold together at the last minute.